Adios Lounge readers should already know that LD (hearts) Glossary [proof here] [more proof here] [oh and here]. Their album Feral Fire is one of the best releases of 2010 and I will write more about that gem closer to Christmas … you know, when you’re looking for gifts to buy your loved ones. Instead, I’d like to highlight a pair of recent Glossary-related releases. The first is Joey Kneiser’s The All-Night Bedroom Revival. Joey is Glossary’s principal singer, guitarist, and songwriter and he originally offered this solo collection of songs for free on the Glossary website. In fact, you can still download the mp3s for free. But, Last Chance Records has released the album on CD and it includes an extra song not on the download. So, why not support one of the country’s finest songwriters with a measly ten dollar bill? Meanwhile, co-conspirator and harmony muse, Kelly Kneiser (pictured up top), just released her solo EP on Tuesday. Like Joey’s album, it’s available for free on the Glossary website. It’s OK, if you like well-written songs sung by a beautiful woman with a sultry voice. So there’s that. Keep in mind these aren’t records meant to pump you up for a night on the town. In fact, quite the opposite. These are records meant to be heard while coming down after a night of a little too much. Maybe during a long drive at night or on your front porch, with a tumbler of whiskey and a smoke, long after you’ve put the kids to bed. These are unpretentious folk songs in the best sense of the term. Sure, maybe I hear a little Nebraska or Uncle Tupelo‘s March album or even Neko Case‘s Canadian Amp EP. 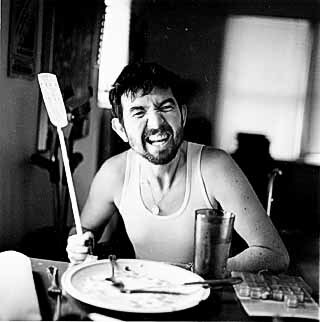 But really who these songs remind me of … and I can think of no higher compliment … is Ronnie Lane (pictured above). And because I love ya and care about your musical well-being, here’s a sample from each album. Get you some. As a bonus, here’s a great video of Joey and Kelly singing “The Big Ocean” off of The All-Night Bedroom Revival. But, they’re not just singing it. They’re singing it while walking over a bridge in Birmingham, Alabama, and it was captured by a fella named Seth Newell in one continuous shot. A veritable touch of awesome. Wow. These guys are great. Thanks for the heads-up. Do you know if they do any shows in the L.A. area? BTW, I love the title of your blog. I wish I thought of that. I'm a huge Thelonious Monster fan. I just saw them this weekend at Spaceland in Silverlake. Short show, but they were pretty good. I've definitely seen them better…and far worse. Keep up the good work. I'll be putting your blog on my favorites. Glossary has actually played 2-3 shows in LA, though I believe it's been a couple years. But, the precedent is there. Wish I could've made the Monster gig, but I had an all-day work junket to attend, outside, in 100 degree heat. As much as I love the band, I'm glad I had every bit of rest and hydration before Sunday suckage. Many thanks for this. Killer band, plus I ride that viaduct on the way home every day. Nice find. Love what you've been doing on here lately; keep up the good work. And by the way, ROLL TIDE. And a hearty Roll Tide to you, good sir. Thanks for writing.